Among all the shades available for coloring hair, red is the hardest to maintain. According to In Style, the dye molecules found in red are larger than the other hues, making it harder for red to deeply penetrate the hair shaft. Even when getting your hair color done at the best salons, red dye will noticeably fade in just four weeks. 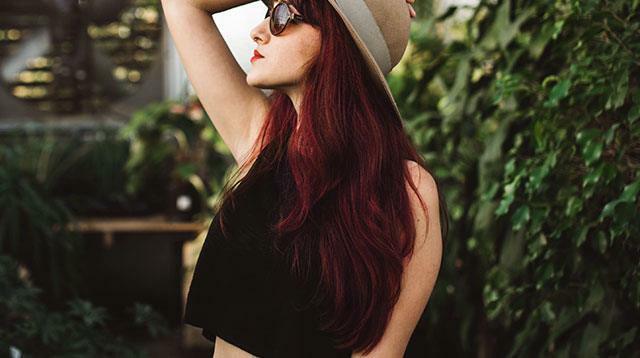 If you’re thinking of going crimson like Emma Stone, Amy Adams, Jane Levy, and Christina Hendricks—none of whom are natural redheads, by the way—here are tips to keeping it vibrant. 1. Do not wash your hair for at least 48 hours from the day you color. The usual rule of thumb is 24 hours, but with red hair, you need to let it set longer. For your first rinse after coloring, use cold water to help seal in the color. Warm water washes off the color faster. Sulfates are detergents or foaming agents added to cleaning products to get rid of dirt and grime. According to Women’s Health, the most common sulfates you’ll find in regular shampoos are sodium lauryl sulfate (SLS) and ammonium lauryl sulfate (ALS). To help keep hair dye from fading fast, use sulfate-free shampoos and conditioners that don’t produce as much suds. Even when using sulfate-free shampoo, getting your hair drenched in water is enough to strip off the dye. Good Housekeeping found that 80 percent of hair dye fade is caused by water alone. Avoid the beach, swimming pools, and even getting soaked in rainfall during the first few weeks after applying hair color. Elements like saltwater and chlorine may also cause a chemical reaction. We’ve heard numerous stories of people who went swimming just days after hair coloring, and emerged from the water with brassy to—gasp!—green hair. If you’re planning to go redhead, book your salon appointment when you know you’re not hitting the beach or pool that month. 5. Avoid too much sunlight as well. Prolonged exposure to sunlight can ruin even the most professionally done hair color, so say goodbye to sunbathing for at least a month. If you can’t avoid direct sunlight, apply hair sunblock to protect your colored mane. Speaking of avoiding water, here’s a secret from hair coloring addicts: We don’t wash our hair every day. We can go up to four days without shampooing. We simply cover our hair with a shower cap when hitting the shower. For those in-between, no-shampoo days, we use dry shampoo. It keeps the scalp and tresses clean and grease-free. Click here if you’re a dry shampoo virgin. There’s only so much skipping shampoo and avoiding water can do, so try color-enhancing treatments. You may purchase DIY products from high-end brands, or just have them done at the salon. Note that these treatments will only temporarily enhance your hair color during the in-between stage—where it’s too soon to get a touch-up appointment, but the fade and roots are getting obvious.